HE “helps”. A girls gotta do what a girls gotta do. PS. You guys crack me up. And NO I don’t exercise every day….some days I get my tennis shoes on and watch leotard ladies exercise while I eat Lucky Charms. I swear Bumbos are the best invention for any busy mom. I cursed the day my oldest actually got too chubby to fit in hers. That sounds like my kind of exercise. I wish they had come out with bumbos when my kids were younger! That is awesome! he is so cute! Allison you are so funny! I love watching excersise videos while I eat breakfast! My little girl loves her Bumbo, too! My husband likes to put a book on the tray, so it looks like she is reading when she is sitting in it. Very cute! Ok – that's more like my kind of exercise! Love your little helper sitting there – so cute! What a great photo, but it does make me sad that my youngest that actually had a bumbo is now 4! I'm a Grandma and I KNOW how important Bumbos are to you and to the baby. He couldn't look happier. I think it is wonderful that you are home with your boys. I was a stay-at-home mom before the term was invented and I will never regret it. Keep on sewing too. Oh wow!!!! That is such a great idea! Dangit I don't think my sewing table is wide enough for me to do that and feel comfortable about it… Ah guess this means I need a new sewing table! Thanks for the idea and ya'll are so cute! My little man sits on my lap and helps me sew sometimes it is hard though cause I have to sit back far enough that little fingers can't reach anything in case I am not quick enough. I love this picture. He looks very interested in what's going on. That probably lasted all of 15 minutes, right? But hey, 15 minutes is 15 minutes. Love the quilt you're working on by the way. Have you seen the "Ready-Set-Bumbo" videos on youtube? http://www.youtube.com/watch?v=j5dPMtuZsCw HILARIOUS! Some SAHD was having fun with the video camera! 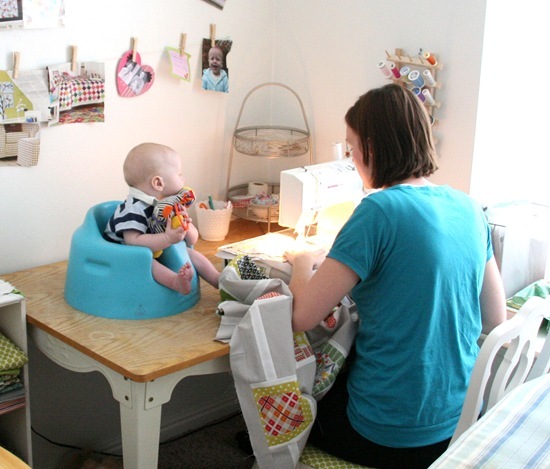 I am glad to be too old to have a baby sitting on my sewing table, but if I had thought of it 45 years ago I beet I would have done it, too. This photo is the cutest thing and I grinning from ear to ear. that is so funny! and a very great idea. :) it's great when they're entertained by just watching every move you make. man, wish they had those Bumbos around when mine was little – smells like genius to me! Sew on mama! I made many quilts with a little one (5) sitting on my lap. Just love how your little one is watching you sew! So very adorable! it's true. sometimes i just wear my yoga pants and let everyone think i've exercised that day. bumbos are the best and your blog is the cutest. What a sweet photo….my grandson had one of those Bumbos and they are great! You go girl! Oh I wish I could do that with my kids!!! They are just soooo big now!!! Thank you! Here I am holding my napping infant during my "sewing" time. Thank you for keeping it real. Note to self-get Bumbo. Too cute and lay of the cereal it must have a ton of sugar in it. My baby boy has the same Bumbo and the same Zebra toy. I'm sure a ga-zillion other babies do to. Just funny to see! darling photo. we have a photo of one of our twinnie granddaughters asleep in a bumbo. great chairs!! I cant even tell you how much I love that picture! Just about the cutest thing ever! Mine are too big to hold captive in the bumbo anymore, unfortunately, so I am forced to use other forms of amusement like cookies, dora, and hide and seek. love this photo – great use of the bumbo! I should have thought of this with my bubby! What a cutie pie!! mine hated the bumbo unfortunately. But she loves watching me sew now that she's two. ha! genius – my baby loves to sit on her mat gazing at me when I am using the sewing machine. I must try a bumbo. hehe! I am pregnant with my first and have been wondering if I would need one of those seats – now I see I Definitely will! What a great picture!